Today I have another great competition for you all. If you have pre-teen girls who have an interest in beauty and nail products, these gifts would make the perfect gifts or stocking fillers this Christmas. These gift sets are just two of the great sets you can buy from Primark. This trio of lipbalms, with cute retro peanuts characters on each one, come in a handy tin and costs £6. With a new Peanuts movie coming out soon these are bound to be a popular gift. 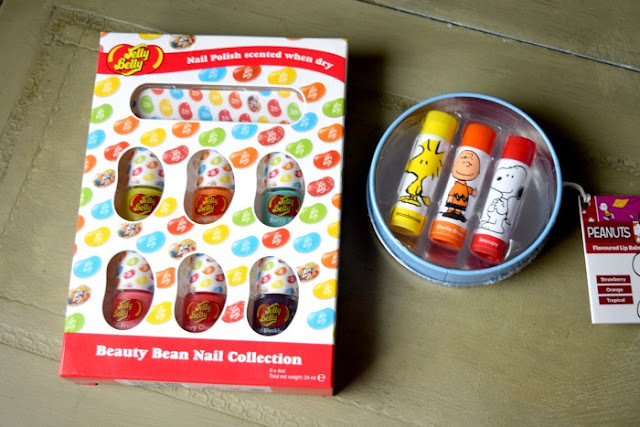 The Jelly Belly Beauty Bean Nail Collection contains nail varnish in lots of bright colours which become scented when dry. This set is just £4 which is a brilliant price! Both are available to buy now in Primark stores along with lot's of other great gifts for men, women & children. You could win both of these gifts for yourself or your loved ones this Christmas. All you need to do is enter via the Rafflecopter form below. Open to UK only. The competition will end 17/12/2015 at 12am. All entrants must complete the mandatory entry on the rafflecopter form. Those who don't will have all entries removed. The blog owner will choose the winner through the rafflecopter form (which uses random.org) The winner will be notified by email and displayed on the widget. One winner will receive two beauty gift sets (as pictured). No alternative prize will be offered. Allow up to 28 days for delivery. My Best friends daughter but I would be really tempted to keep the lipbalms, with the retro peanuts characters for myself. I would give it to my daughter as she would love this, thanks. My niece as she's growing up so fast! I would give this to my secret santa participant...they would love it! My daughter would love these. Perfect stocking fillers. My best friend would love these! Looks nice to give to my friend. I would give it to my cousin, she loves things like this! I would keep the lip balms for me (sorry) as I collect them but I would give the nail set to my niece. My lovely neighbours daughter who is so patient with my 4 year old daughter. She would so deserve it. We would give these to our children so thanks for the opportunity!